With winter looming, it’s a good time to start thinking of ways we can update our wardrobe and inject some winter warmth into what we already own. It’s all about choosing new pieces that will work with what we already have, rather than buying whole new looks head to toe. Adding one current winter trend to our look is an easy way to refresh, edit and prepare for the cooler months. Here’s the good news, thanks to Vicinity Centres we can shop some of winter’s finest fashion all under one roof. 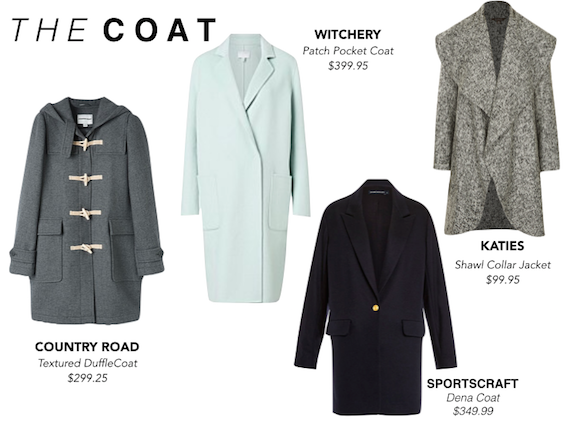 I’ve made an edit of some essentials for the cooler season which you can purchase in store now, visit vicinty.com.au to find your nearest centre. Happy shopping! Last night saw the launch of my brand new venture, Tea With Jules. The concept behind it is to sit down with inspirational people and let them tell their stories of triumph, challenges, road blocks and achievements. Within my own friendship circle, I am kind of known for my home being a place to come to for a cup of tea and chat on the couch. If you have not yet discovered Make Up Store – you are in for a real treat. Their product is beautiful and the staff are very friendly and so helpful – you will never want to leave and you will want to buy one of everything!! Here are a few products I have tried, tested and LOVE.